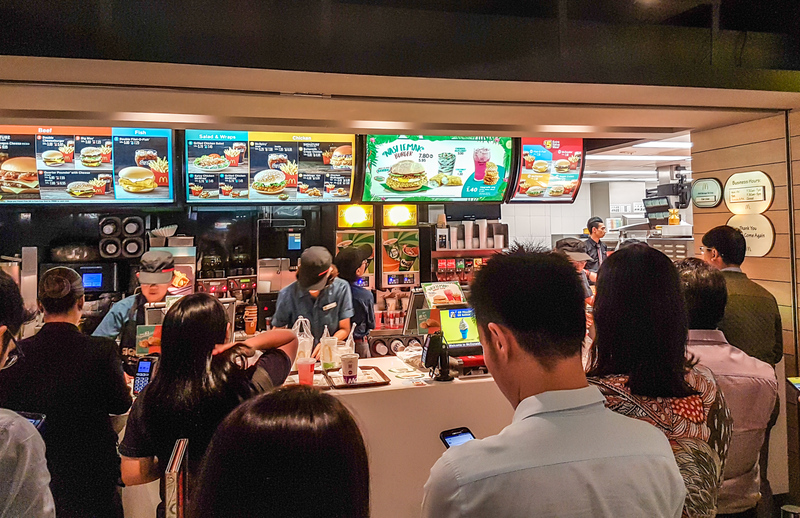 Right on the very first day of its release, my colleagues and I decided to venture down to the McDonald’s at Clifford Centre for lunch. It was only 11.40am and there was already a sizeable queue. Thankfully, there were still seats so that’s part of the equation solved. We waited patiently for our turn, and received our burgers within fifteen minutes. 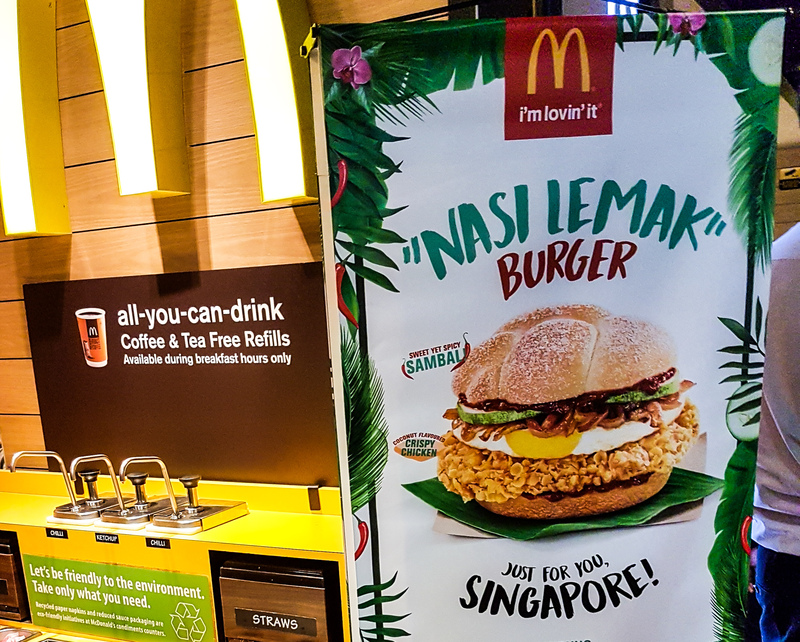 Being really hungry at that point in time, I opted for the “Nasi Lemak Burger Feast”, which comprises the burger, regular fries, a Bandung McFizz as well as a coconut pie. You can opt for the regular fries to be swapped for criss-crossed fries if you upsize. My colleagues who tried the criss-crossed fries commented that they weren’t very crisp, so your mileage may vary. While I thought that using pandan leaves would make the experience even more authentic, I guess they had to draw the line somewhere. The burger itself is wrapped in wax paper. While I thought that using pandan leaves would make the experience even more authentic, I guess they had to draw the line somewhere. 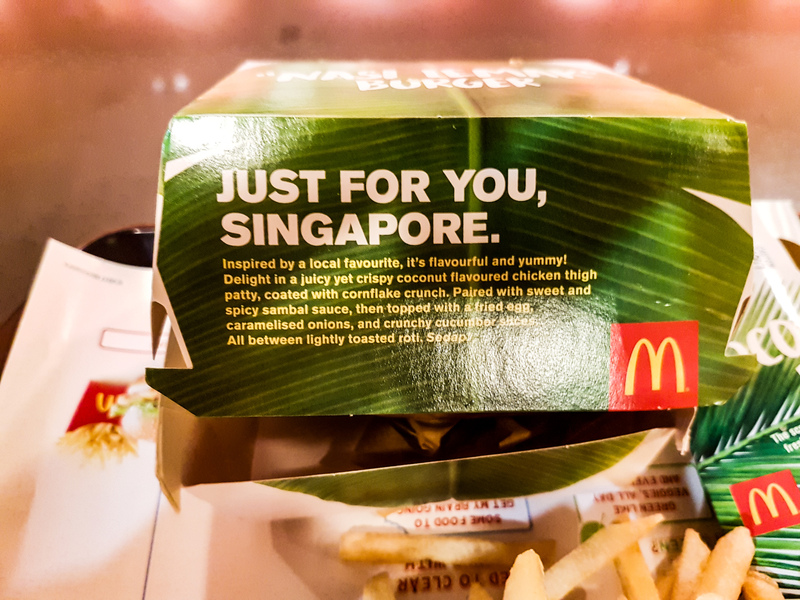 The ingredients are sandwiched between two of McDonald’s higher-quality patties (I think it’s also found in the quarter pounder and their Angus Cheese/ Buttermilk Chicken burgers). Most of the goodies in a typical nasi lemak are present–cucumber, sunny-side egg, sambal sauce and fried chicken. Okay, maybe except the nasi itself and ikan bilis. Taste wise, one of my colleagues thought it great, and my other two colleagues felt it was good. 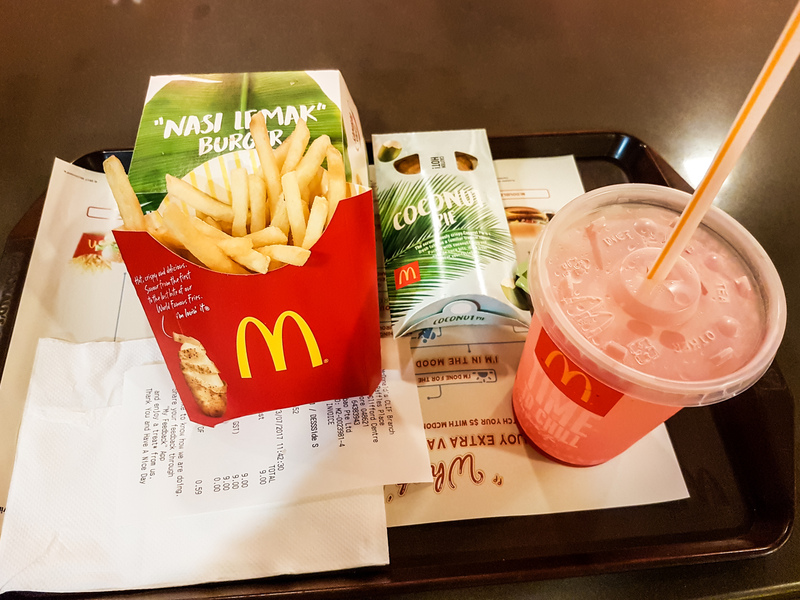 As for myself, I liked the patty very much and I really hope that one day McDonald’s comes up with a McSpicy without the spiciness and accompanying laxative effect. Though, I couldn’t really taste/ smell the fragrant coconut/ pandan aroma because the sambal sauce was rather overpowering. Perhaps it’s just my preparer (burger barista?) being overzealous. I also question the presence of cucumbers; I don’t think anyone actually eats the cucumber on their nasi lemak? 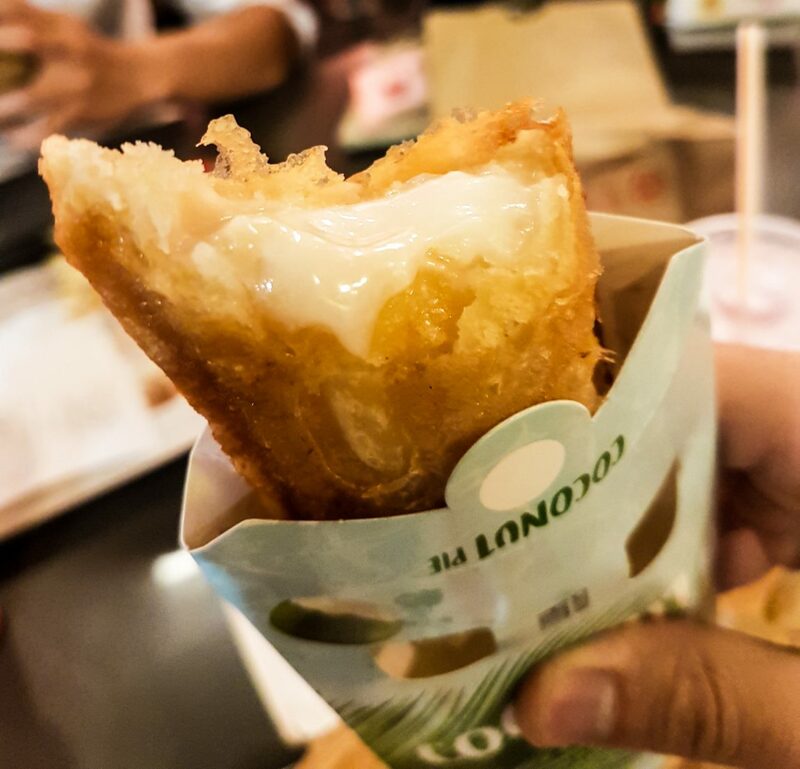 That being said, it’s still way ahead of the salted egg burger. Replacing last month’s banana pie is the coconut pie. Taste wise, it’s rather similar to the apple pie. I didn’t really taste anything ‘coconutty’ about it. Maybe that’s a good thing, because I’m not a big fan of the coconut taste in general. The Bandung McFizz is perhaps the surprise star of the show. Bandung isn’t really my thing–it tastes too artificial, and often too sweet. Here, McDonald’s has muted the taste a little, but the carbonated water makes up for it. Overall, while you can still taste the rose syrup (a good thing), it’s pretty light on the palate (and hopefully calories)? I wish there was an upsized option for the drink. 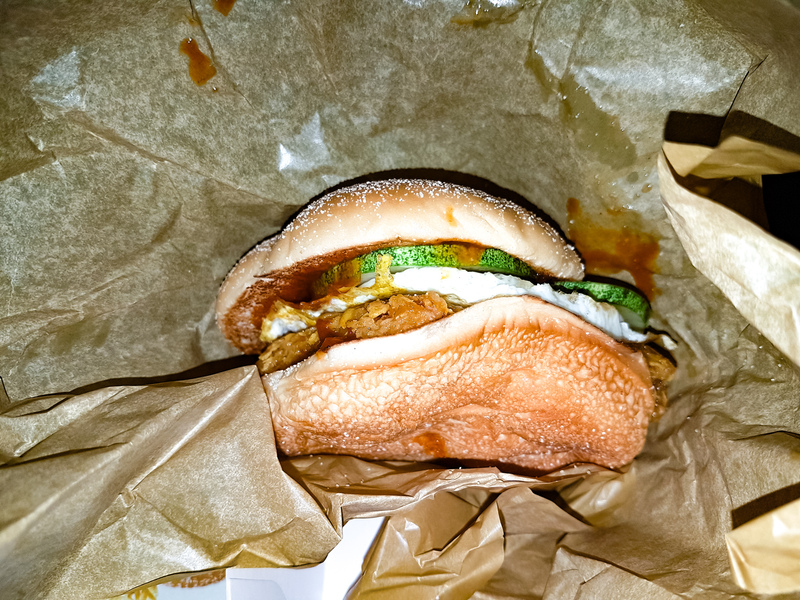 Perhaps MOS burger can take heed and introduce a true Nasi Lemak burger with pandan rice patty? So long, iPod. Thanks for the memories.